Home Shows Straight Talk What Happens When Someone Lies to You? 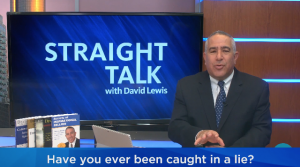 On this week’s episode of Straight Talk, David Lewis of David Lewis and Associates talks about what happens when the customer lies to you, something that happens fairly regularly to salespeople. Hello again and welcome to this week’s episode of Straight Talk. I am David Lewis the host of the show, and I want to thank you for joining me today as I give you straight answers to many of the questions and challenges you will face while working in the retail automotive business. Today’s topic is one that should sound familiar to most of my listeners and it has to do with what happens when someone lies to you. By someone, I mean one of your customers. This is not something unfamiliar to most car salespeople and in fact the old adage “all buyers are liars” has been around for a long time in this business and will probably continue to be passed down to the next generation of salespeople by those who feel that way about customers. When a customer lies to you it is generally a defensive act that is based in fear or some negative factor that causes them to lie as a way of protecting themselves. The fact of the matter is, when people lie to you they get defensive and when they get defensive they will defend their own lies. Most people have a low opinion of car salespeople and feel that they will take advantage of you anytime they can and therefore lying to a car salesperson is not a big deal on the morality scale. They may justify their lying by saying to themselves that all car salespeople lie to sell cars and that what they are doing is just protecting themselves from what all car salespeople will do if they can get away with it. Question number 1 is this: Have you ever lied to your spouse or significant other? And I am pretty sure at one time or another most of you have done this. Question number 2 is: Have you ever lied to your spouse or significant other and gotten caught? And Again, I’m pretty sure most of you will say yes. And Question number 3 is: Have you ever lied to your significant other, gotten caught, and then defended your lie? And Once again, I’m pretty sure most of you will answer in the affirmative. Well that is basically what a customer does. When you back them into a corner and expose their lie they will defend their lying with some kind of justification for why they said what they said. You ask them what their budget is and they lie to you. You ask them what their trade value is and again they lie and give you an unrealistic number. You ask them what their buying timeline is and they lie to you. And when you ask them if they have already spoken to someone at another dealership, they lie to you again. And then after all of that they defend their lies and justify themselves for the fact that they lied. You do not want people to lie to you when you are trying to sell them a car. By not having them lie to you, you don’t get stuck in uncomfortable situations that can muddy up the waters and make it hard to come to a workable solution with the purchase of a vehicle. So why do people lie to you when you ask them questions in the process of trying to sell them a car? That is a good question and one that actually played a big part in the start of my company and going into the training and consulting business back in 1986. It wasn’t long after I started selling cars that I heard some of the salespeople state that “buyers are liars”. Of course, I heard it many times over the next few years and it always bothered me that thinking that way about the people who provided me with a living and it seemed like such a bad way to think about my customers. In fact it bothered me so much I begin to study the problem and my conclusion was this: buyers lie to salespeople because of the questions we ask them in the process of trying to sell them a car. Questions they are not ready to answer at the time that caused them to feel pressure and caused them to become defensive to avoid the probing questions we are asking. If the questions we ask caused customers to lie to us, the solution was to quit asking those kinds of questions. Let’s face it, people in our business do not have the most favorable reputation with the public. In fact, every year when Gallup does their annual poll on ethics and honesty in business, car salespeople are usually 2nd from the bottom just above members of Congress. If a crowd is supposed to represent the swamp, that doesn’t put us in a very good light with people either since we are just above them in reputation by only one step from the bottom. That in itself is enough to clarify why customers come to your dealership with their defenses intact and under the general impression that our only goal as car salespeople is to sell them a car that day, no matter what we have to do to make that happen. They figure since we are professional at lying and manipulating, telling lies to protect themselves from that happening to them is not really a big deal in comparison. So, when we asked a customer about their buying timeline, their credit rating, their down payment, their trade-in value or whether they have spoken to another salesperson or dealership already, they lie. It’s as simple as all that and the solution is just as easy to achieve. Stop asking those kinds of questions. The truth is though, do those kinds of questions really have anything to do with what our real job is in the beginning of our sales process? Not really, our initial goal is to lower their defensive posture so that they can find a car they love, fall in love with you as the salesperson and then want to do business with your dealership. The only questions we need to ask to find that out are: New or used? Make and model? And coupe, Sedan, minivan, utility vehicle or truck? What more do you need to know. Once you start the process the customer will tell you everything you need to know by just watching their posture. When they see a car they like, you will know. When they look at a window sticker you will know if it is affordable. Buyers are not liars, they are people you are asking to spend tens of thousands of dollars on a product you are selling based on your ability to get them to like you, help them feel comfortable about working with you and buying from your dealership. And when they have found the car they want to buy, convincing them that they are dealing with a company that will honor their business, respect them as valuable customers, and do their best to help maintain the value of their vehicle investment for as long as they own the car.
. . . . . Well that’s it for today’s program friends. I appreciate you taking the time to join me for this very important topic of customer lies and how they affect your business And as always if you would like a complimentary copy of my books just send me an email at dlewis@davidlewis.com and I will ship them out to you immediately.